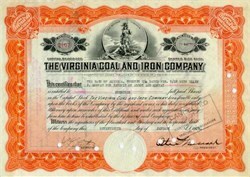 Beautifully engraved Certificate from the famous Virginia Coal and Iron Company issued in the 1920's. This historic document was printed by the Security Banknote Company and has an ornate border around it with a vignette that depicts the Roman Goddess Virtus representing the spirit of the Commonwealth. She is dressed as an Amazon, a sheathed sword in one hand, and a spear in the other, and one foot on the form of Tyranny, who is pictured with a broken chain in his left hand, a scourge in his right, and his fallen crown nearby, implying struggle that has ended in complete victory. 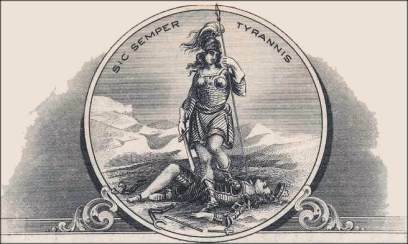 Virginia�s motto, Sic Semper Tyrannis (Latin for "Thus Always to Tyrants"), appears at the top. This item is hand signed by the company's officers and is over 75 years old.